The chaos of the winter transfer window is almost upon us as chairmen across the continent open their chequebooks, whether it's in search of the title, promotion, European qualification or just hoping to stave off relegation. BBC Sport assesses 50 possible moves that could happen in January. Stats correct up to 28 December. It seems 'Gabby' is surplus to requirements at Villa Park under Remi Garde. With the club bottom of the table, it could soon be time to start preparing for life in the Championship next season. Agbonlahor could be the first of many to depart and be taken off the wage bill. Tottenham failed with four bids in the summer and the striker then tweeted he would never play for the club again. He has done, but things haven't been quite right ever since. Having completed just one full 90 minutes all season, his time at Albion could be up in January. After a failed loan spell at Manchester United last season, former Chelsea boss Jose Mourinho thought he could get the best out of the Colombian once again. He was wrong. Falcao has managed to find the net just once this season and the Blues could be looking to cut their losses early. 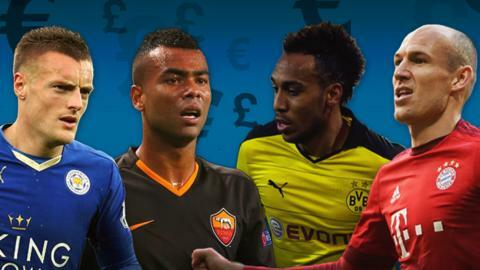 Victor Wanyama, Kevin Mirallas, Jamie Vardy and Andros Townsend - who will move in the transfer window? The Englishman's hat-trick in the League Cup against Charlton in September looked to be the start of something special and his club have kicked on to challenge for a European place, but Gayle himself has failed to cement a place in the starting XI because of the form of Connor Wickham. The superb form of midfielders N'Golo Kante and Danny Drinkwater has seen Inler's chances at the shock Premier League challengers limited to just seven appearances. The Switzerland captain may feel he needs regular football going into Euro 2016 and a loan move could materialise. The Spaniard, who joined from Barcelona, has had an impressive return to Premier League action after an injury-hit previous season. Although he has netted just five this term, his runs and movement have been a handful for opposition defenders. Big clubs have been watching. After leading Northern Ireland to Euro 2016 qualification, Lafferty needs minutes on the pitch to make sure he stays in the squad for the tournament. Out of favour at Carrow Road having made just one appearance this season, he may look to drop down a division for much-needed game time. The speedy Senegalese winger has been the star of a Southampton team that hasn't really hit top form so far this season. Having seen their best players such as Adam Lallana, Luke Shaw and Morgan Schneiderlin leave over the last couple of seasons, Mane may well be the next in line to leave the south-coast club. Mirallas has found opportunities limited at Goodison Park this season, particularly because of the fabulous form of Spaniard Gerard Deulofeu. With a European Championship taking place in the summer, the Belgian will be wanting as many minutes on the pitch as he can get. A temporary move may be on the cards. Ospina was always going to play second fiddle when Arsenal signed Petr Cech in the summer. The Colombian hasn't played since their shock 3-2 Champions League loss at home to Olympiakos. The England international has been out-of-favour at the club this season and is another who will need minutes as he looks to book his place in the squad for Euro 2016. Having been linked with Newcastle and Sunderland, he might have to help out a club battling against relegation to do that, though. The forgotten man, Spanish goalkeeper Valdes has seen precisely zero minutes of action this season after falling out with manager Louis van Gaal. A move failed to materialise in the summer transfer window, so he will try again to escape from his Old Trafford nightmare. Record-breaking goalscorer Vardy has attracted the attention of some big-name clubs after scoring in 11 consecutive Premier League games. It will require a big offer to sign up the England forward from the Foxes. Afobe's future at Wolves is up in the air with the club unlikely to gain promotion to the Premier League at the end of the season. The frontman has netted 10 goals this campaign and a struggling top-flight side may go in for him for his ability to find the back of the net. Austin decided to stay with the club after relegation to the Championship and he has a decent return of 10 goals this season. His contract expires in six months and Rangers may cash in, but it may need a bid of £15m to prize the Englishman away from Loftus Road. Walsall's rise up the League One table has owed much to the goalscoring exploits of Bradshaw, who has netted 12 goals in all competitions this season. A man who can find the back of the net is a priceless commodity in football and in Bradshaw's case has inevitably led to reports of a move to a bigger club. Academy graduate Byram has long been linked with a Premier League move. Transfer talk has followed ever since he won the Whites' player of the year in 2012-13 as a teenager in his debut season. Now, he looks almost certain to move on to the top flight, having rejected a new contract at Elland Road. Not to be confused with the Tottenham midfielder of the same name, this Paris St-Germain product is building his own reputation. Dembele has scored 10 times this term and his pace, strength and finishing have caught the eye. The centre-back has been followed by Premier League clubs for some seasons, though none have yet seen enough to take him. Championship side Fulham had a £4m offer turned down in the summer but this January might be different, especially with Newcastle suffering so many problems in defence. Gray was signed by Burnley only last summer in a £9m move from Brentford, but he has been so impressive at Turf Moor that it could be a short stay for him there. Understandably, Burnley see Gray as vital to their promotion chances and plan to resist. Gray has star quality. He is quick, tricky and brave, and he won't be playing in the Championship for much longer. Birmingham resisted three bids from Bournemouth for the player last winter. Bournemouth are now desperate to avoid the drop from the Premier League and might go back in again. What verdict will the clubs who have been watching Alan Judge come to in January? The Republic of Ireland man has been one of his team's best players this season and has been watched by numerous top-flight clubs. His contract expires at the end of next season and while Brentford are keen to renew, Judge may want to try his hand in the Premier League, if a bid comes in. Mowatt is a clever, left-footed playmaker and with little stability at Leeds these days, a top-flight club may try to prise him away. He is a regular in the Leeds side since making his debut in 2013 and winner of the club's player of the year award last season. Newcastle remain interested. Another transfer window, another potential Rhodes move. Still relatively young and still scoring goals, will a big-money move finally materialise for the Scottish frontman? Sheffield Wednesday were heavily linked with him in the summer and could come in again. What's Pierre-Emerick Aubameyang's Spidey sense saying about the transfer window? With 24 goals in 23 games this season, the Gabon international is the leading scorer in the Bundesliga at the winter break. Former coach Jurgen Klopp would like him at Liverpool, but it is worth noting that Aubameyang is under contract until 2020 and the player has recently stated how happy he is at Dortmund. The Belgian has graduated from super sub last season to focal point this time around after the departure of Andre-Pierre Gignac. At the age of only 22, he is likely to make the Belgium Euro 2016 squad and has scored in both of his appearances for his country so far. Only PSG striker Zlatan Ibrahimovic has netted more goals than Batshuayi in Ligue 1 this season. Manager Arsene Wenger has a holding midfielder on his radar following the injury to Francis Coquelin. The German international - the twin of Borussia Dortmund player Sven - has played in the Champions League this season and is solid and dependable. Cole has had such a bad time in Italy that his club could agree to cancel his two-year contract a season ahead of schedule. The former England left-back made just 11 appearances for the Serie A side last season and hasn't played a single game this term. He could surely do a decent job for someone in the Premier League, if they can get him fit. A short-term signing worth considering. Dutch football is down in the dumps but El Ghazi is the kind of player who can cheer the fans up again. He made his senior Netherlands debut late in 2015 and many more caps are expected. Only a matter of time before he moves to a bigger club, possibly in the Premier League. One of the world's top forwards at the moment, Higuain would give Chelsea the cutting edge they have lacked because of Diego Costa's loss of form. Higuain has two-and-a-half years left on his contract and a bid of £50-60m could perhaps tempt Napoli to sell. After progressing from the well-regarded Feyenoord academy, Kongolo was given his debut in April 2012 by Ronald Koeman - who has been linked with a move to take him to Southampton. The defender is part of the Netherlands' rebuilding plans for the coming years and has also been scouted by Manchester United. Yes, it might be surprising, but stranger things have happened. The Dutchman has had a new lease of life after returning to his homeland. Second highest scorer in the Eredivisie this season with 13 goals, Kuyt could head to the Nou Camp with Barcelona looking for an experienced forward to act as back-up to Lionel Messi, Neymar and Luis Suarez. The Pole has been watched regularly by the Gunners, whose need for a defensive midfielder has increased since Coquelin damaged knee ligaments in November. Krychowiak has been a key man for the back-to-back Europa League winners. Will anyone take him now? Morrison ran out of chances at Manchester United, blew it at West Ham and has not settled at Lazio, either. He is desperate to return to England in January although his baggage - fined for criminal damage, a caution for common assault and admitting two counts of witness intimidation - might dissuade most clubs. A regular in the Porto side as well as taking the captain's armband at his tender age, Neves is already a Portugal international and looks destined for the top. Suitors have been attracted from the Premier League but will have to shell out big money to sign him up. The Barcelona youth product is having the season of his life and playing so well that his old club have apparently thought about taking him back. Arsenal have been linked, too, but they're not exactly short of wide attackers, and Nolito will be 30 in October. Norwegian starlet Odegaard has failed to make an appearance under Rafael Benitez this season and the teenager needs minutes to continue his development. A loan move is more likely than a permanent one. The young Frenchman has said he wants to leave the club on loan in January, despite featuring quite often for the Ligue 1 leaders this season. Is a place in the squad for Euro 2016 playing on the mind of the France Under-21 international? A supremely talented young player, but unlikely to have regular football at Barcelona any time soon. Tottenham head coach Mauricio Pochettino reportedly admires Sandro and the north Londoners are following him closely. Leaving Barca might mean never returning - would Sandro take that risk? The Dutchman's season has been disrupted by injury, but he has still managed five goals in 12 games for the Bundesliga leaders. With Manchester United's need for pace in the wide areas, he could well be the marquee signing Louis van Gaal needs for his side. Few countries are better than Germany at producing high-class midfielders - and Sane is the latest. Even though he has made only a handful of appearances for Schalke, Sane has already earned a full cap for the national side and Jurgen Klopp is a firm admirer. Sporting are trying to win the Portuguese title and it is thought they would demand at least £14m to sell the Algerian in January. The price is likely to drop in the summer, but Palace boss Alan Pardew might decide to take a gamble in order to strengthen the club's chase for a European spot. Slaven Bilic worked with the Turkey international at Besiktas and it is believed he would like to bring him to Upton Park. Tore is quick, direct and aggressive and should do well in England - but top clubs in Turkey are cash-rich and Besiktas could tempt Tore to stay. After two excellent seasons at Sassuolo, Zaza has struggled to cement his place in the Juve first team and could leave Turin, initially on loan. He has won seven caps for Italy but there are doubts about whether his style of play is suited to the English game. Will a Premier League club salute Emmanuel Adebayor in January? If he can be motivated, Adebayor is still an asset. Watford boss Quique Sanchez Flores is a fan of the centre-forward and the Spaniard is a good man-manager. If he were offered a contract to the end of the season and the chance of an extension, Adebayor for free could well be worth the risk for someone. Tipped as a future star, Nwakali was the captain of the Nigeria team that won the Under-17 World Cup earlier this year. His brother Chidiebere Nwakali is already at Manchester City and there is speculation that he will soon be joining him at Etihad Stadium. Top scorer at this year's Under-23 Africa Cup of Nations with five goals in five games, including two goals in the final. European scouts at the Olympic qualifying tournament were impressed with the Nigerian's performances. He may wait until after Rio 2016 before possibly moving. The Brazilian and his advisers are desperate to move him to England. Corinthians' £15m asking price is high, but Pato has rediscovered his best form after five injury-hit years at AC Milan and possibly still has his best years ahead of him. Tanzanian Samatta has spent five years at one of the biggest clubs in Africa, TP Mazembe of the Democratic Republic of Congo. But Samatta has hinted that he is ready to sign for a European club and he's been linked with a move to Belgium. The forward - who played in the Club World Cup - was one of three players nominated for the CAF African footballer of the year (based in Africa) award. The promising South Africa international is expected to leave Mamelodi Sundowns at the end of his contract next summer. Zungu says he has spoken to Benni McCarthy and Yaya Toure, who have advised him to make the move to Europe. Clubs in Portugal have already expressed interest. Additional reporting by BBC World Service Sport's John Bennett.